I'll certainly pray for you, I know how challenging it can be at times to care for your parent on a daily basis. God bless you and your mother and give you both rest and peace. I love Smitten Kitchen recipes! The spaghetti sauce is wonderful. LOOKS so good! I love granola on my yogurt. I have pinned several recipes from Smitten Kitchen - I'll be the cookbook will be a hit! Prayers as you go to care for your mom! Bundle up -- my parents live in Ohio and it's been nothing but snow although they are north so it's lake-effect. 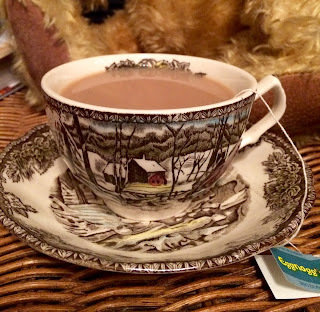 I am sorry about your mother,I hope she gets better soon and I will pray for her...Your post is charming as ever,Kitty!That Teacup is gorgeous!Best Wishes! Oh Kitty, what a way to start the year. I hope your Mother heals quickly. Prayers to all of you. Praying for a quick mending for your Mom after she broke her shoulder. How awful for her and what a way to start a new year. Safe travels as you go home to help her out. Oh, dear friend! I am SOOOO sorry to hear of your dear, little Mom's fall! I will surely be praying for her, and, of course, continuing to pray for you, too. Bless your dear hearts. May God send healing soon and give you safe travels. Sending love and hugs to you and your Mom on this New Year's Day. Of course I will be praying for your mom and for your safe travels! I love the sound of oat brittle. How awful that your dear mum broke her shoulder. Hope she recovers well and the pain becomes less with each day. Take care, lovely Kitty. Kitty, I'm sorry to hear of your mother's fall. You've got my prayers for a speedy recovery and complete healing. With you by her side, I'm sure she will feel mentally safe and sound. Oh Kitty, I am so sorry to hear about your dear mother falling and breaking her shoulder...certainly not how anyone wants to begin the new year! That is a very painful injury...we see so many here in the PT clinic. I do pray that her pain will be under control soon and that her healing comes quickly. The oatmeal brittle sounds absolutely wonderful as well as the tea. Safe travels as you go be with Mom and hope to hear a good update soon! Hugs! Happy New Year, Kitty! I used the same Friendly Village tea set for my first cup of tea in 2018. Great minds think alike! I also enjoyed the Eggnog'n tea that you kindly shared with me. I can see why it's one of your faves. I'm sorry to hear about your mom's injury and will definitely remember her in my prayers. Kitty, I'm a little behind already. So sorry to read about your mother's fall. I will be praying for her and you as you travel and care for her. Your teacup is so pretty and I'm glad to hear about your tea. Since I love egg nog I will look for this tea. I didn't have any egg nog this season. We have mighty cold weather also. Very unusual to last this long. Oh Kitty, I'm so sorry to read of your mother's fall. I know she will be so glad to have you near her. Blessings and grace as you help her. Kitty, I'm so sorry about your mother. With your tender care, she's bound to recover quickly! Wishing you a wonderful 2018. Love your use of the cloche; I must remember that so I can copy it! Dear Kitty: The teddy bear sure matches up with Friendly Village and I seem to be seeing lots of those snowy scenes right now! Loved your post and knowing that oats are good for us - count me in! Thanks for sharing! Ah, we basically had this over baked apples last night. So many variations...but this looks delicious. 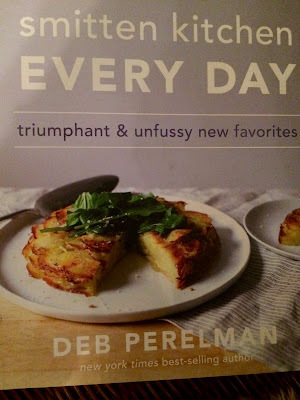 What a sweet sounding cookbook. I love anything with oats so it sounds great and easy. Sorry your Mom is in so much pain. Safe travel as I am sure they have the snowstorm we are getting in NY! I will send prayers for you and your Mom. I'm sorry to hear that she fell and hurt her shoulder. Your new Cookbook looks wonderful! 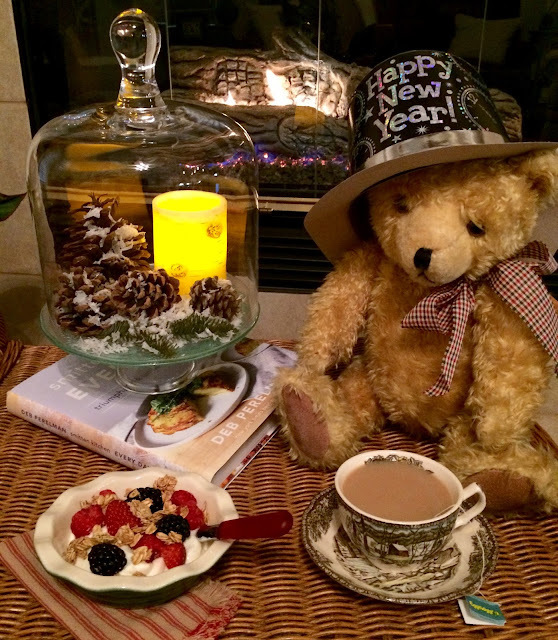 A happy tea party is the perfect way to welcome a new year. I hope you mom improves quickly and is able to enjoy one. Stay warm! Oh, I've got to make this Kitty! I love granola in my yogurt, so I know I will love this. I have a couple of Johnson Bros. teacups that I've found at thrift shops, but no saucers to match. Thanks for sharing with SYC. Kitty, I hope your travel to help Mom goes well. I hope good things come from the fall and time spent with her will be a blessing. Sylvia D.
I am so sorry to hear about your Mom and will be lifting her up in my prayer. Please take care of yourself as you are taking care of your Mom. We will miss you and look forward to your speedy return home! Your Oat Brittle looks delicious and that looks like a great cook book. Happy to see you here at Full Plate Thursday and thanks so much for sharing with us. Oh I will definitely pray for your mother! How wonderful that you can go and help her out! I used to make something like this for myself before I was really a cook - I would put it on my fresh peaches or ice cream. Mine didn't have luscious maple syrup though - have to try some of this to snack on. I love that you have a little winter decor. We try to leave something up too, so the house isn't totally naked. I agree this sounds much easier than making granola! 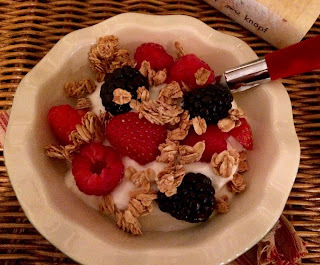 Paired with the yogurt and fresh fruit, this makes a winning breakfast combination! I will be in prayer for your dear sweet mother! I'm so sorry to hear of her fall and extreme pain! Do be careful yourself, and keep us updated as you can! Hello Kitty, oh I am so sorry to hear about your mom and her accident. I hope that she will have a full recovery from her broken shoulder. Sending hugs your way. My prayers sent for your Mom. Terrible to have broken her shoulder like that. Had to be terribly painful. I will make this Kitty. Any thing with maple syrup I am taken to right away. I'm so, so sorry to hear about your mom's fall; that's such a difficult thing for all of us as we age. Your mom IS little -- I remember seeing pictures of her on your blog. I will certainly pray for her speedy recovery, Kitty. I've already pinned this recipe for oat brittle and appreciate your suggestion for serving it atop some good Greek yogurt. I will definitely have to try this! Love your Johnson Bros. Friendly Village (I've never seen a Johnson Bros. pattern I don't like). :) Your table vignette looks warm, cozy and inviting. Take care, my friend, and I'll be thinking about you and your mom! So sorry to hear about your mother. I'm sure that she is grateful for your help and love. Wishing her a speedy recovery. I am so sad about your mom...you being there for her will help her heal quicker, I just know. Prayers she will recover quickly. This recipe sounds amazing and I want to give it a try. Kitty, I hope you've been taking care of yourself as well as your dear mother. Looking forward to your next update.